I set foot on Staten Island for the third time in my life today. 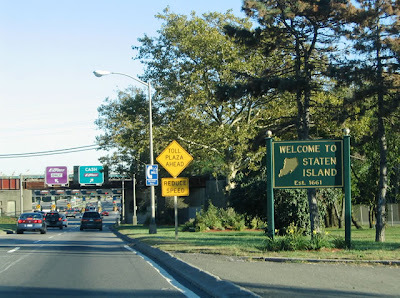 Staten Island, for those unaware, is a borough of New York City, one of five, though in virtually every respect--geographically, culturally, architecturally--it's part of New Jersey. There's an old neighborhood, St. George, near where the Staten Island Ferry docks after its trip from lower Manhattan, that retains vestiges of New York. The rest of the island, which is quite sizable, consists largely of private, middle-class houses--large and flimsily built--, many trees, strip malls and the world's most voluminous landfill. About 15 years ago, my friend David and I biked to the ferry from the Upper West Side, took it over to Staten Island and toured the place, a fairly extensive, for me, ride of about 60 miles total. There are parts of it, when you get to the higher hills, where you think you might be in the Catskill Mountains, unpaved roads winding off into the thick woods, dead quiet, etc. That's not where I was today. A month or so back, Kurt Gottschalk contacted me, asking if I'd participate in a project, a realization of John Cage's "49 Waltzes for the Five Boroughs", written in 1977 and, as near as he could determine, only ever performed once. I knew the event was taking place but didn't for a moment think it appropriate to contribute. However, the score for the work instructs an individual to go to one of 147 designated locations (49 groups of three) and "do something". Kurt thought I could write about what I experienced there, particularly the sounds heard. Well, how could I refuse? Nice day. The results of this endeavor will be posted at wfmu.org at some future date. As far as I know, people played music, made field recordings, videos, etc. Not sure if anyone else simply observed. It was a purely residential neighborhood with no convenient sitting place on any of the four corners. I'd found an elementary school a couple blocks away with a nice set of stairs and almost substituted that but figured I'd play it straight. One of the odd things was that, for all the extensive car traffic, there were virtually zero pedestrians. People don't walk there, apparently. I counted two in an hour and could often look up and down Richmond, about 1/2 mile of straight road, and see absolutely no one on the sidewalks. Very enjoyable undertaking though. I do a reasonable amount of "Cageian" listening in the normal course of things, not as much as I might but more, I daresay, than your average Joe. But it's different when you're constrained to do so for an extended period and, more, to write about it. You concentrate better, or at least I do. It's be nice to have that level of clarity at all times. Maybe some do. Drove back into Manhattan to meet up with other participants at the north end of Madison Square Park, beneath the statue of Chester Alan Arthur, exchanging stories from around the boroughs. While in Staten Island, one of the nice, almost giddy sensations was knowing that 48 [it turned out, 61] other people were engaged in some tangentially related activity at the same time, elsewhere in New York. Something rather comforting in that. When the results are posted, I'll let people know. Nice Brian, will keep an eye open for the results of this. I'd seen Kurts posts regarding this on the Cage list so nice to have a firsthand account. Yeah looks fun, looking forward to reading this. Not sure how worthwhile it will be to read--kinda weird writing about it in real time, as things happen. Richard, are those recent works? I could find iages of only two on-line (Cage (1) and Cage (2)). Thanks, Jesse. I'm only going from reproductions in the case of the Cage paintings, but I have an odd reaction to "similar" works by Richter (ones in that 'dragged' style): I'm initially a bit off-put by what I read as excessive surface busyness, but a couple of seconds later I shift focus and begin reading it as a kind of scrim through which to see great depths, even fuzzed out images, not intentional on Richter's part, I don't think, but my own brain trying to organize patterns given the depth projection I'm making. I've been meaning to get a critical monograph on Richter sometime; any recs would be appreciated. That's a nice little film Jesse, thanks for pointing that one out. My struggle with those paintings may be similar to yours Brian in that I found it hard to separate the images from my guesses at the processes used to make them. Still, they had a certain charm about them when displayed together like that, something I like a lot about how the Tate Mod do things. The Twombly Four Seasons paintings are all shown together, as are the Rothko Seagram paintings, although two of them were missing yesterday... not sure where they might be right now. 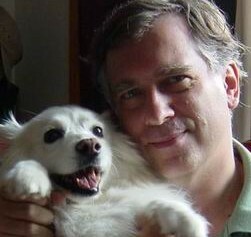 Robert, btw, at least two people more or less associated with the eai/IHM scene were to have participated on Saturday, Bryan Eubanks and Richard Kamerman, though neither turned up at the after-event gathering so I don't know what they did, if they showed, etc. fhtoI have Gerhard Richter 40 years of paintings; 100 pictures; landscapes; the daily practice of painting and another one which I can't remember offhand. All are excellent, 40 years of painting probably gives the best overview from what I remember. I must look them out I haven't read them for a while. I wondered where that fhtol had got to. I've just had a look at Amazon and am sorely tempted by Atlas, it may be what you are looking for. Yeah, next time I have the cash to blow, that Richter 40 Years book (I saw the exhibition at MOMA then) looks good and I still need to pick up the large Rothko volume--I forget the actual title. NYT ran an article today, at least on-line, though I don't think it made the print paper. Too long to print here, I guess. 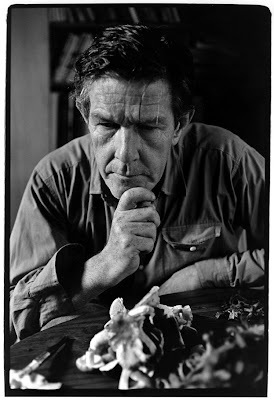 Anyway, you can go to the New York Times page, search there on "john cage" and you'll see it.